Well folks, today’s launch is in full gear. 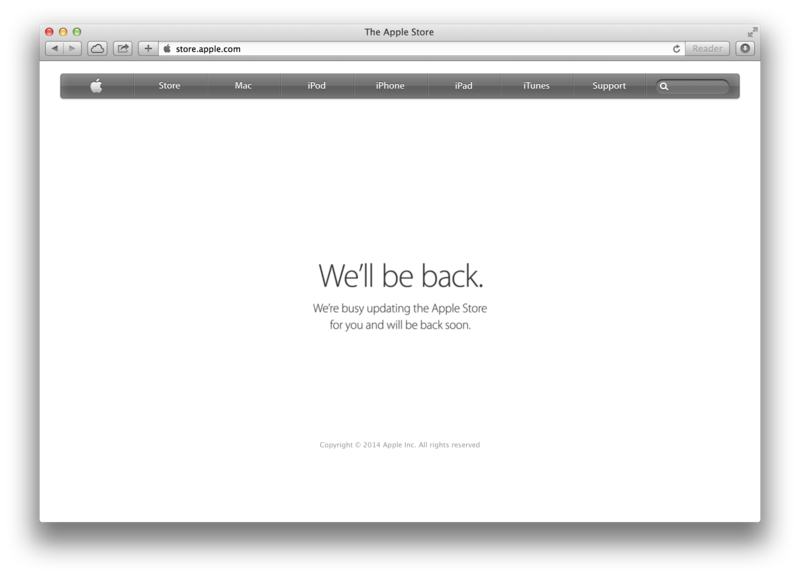 Apple’s Online store went down a couple of moments back, promising to be back soon. When the Apple Store will be back, we can expect it to come with the iWatch and both the iPhones showing. Complete information of today’s products can be expected with the Apple store coming back. Apple is expected to be in full gear to launch the iPhone 6 and the iWatch today. While the posting on the Apple Store will finally tell us officially what the devices are capable of, we already know quite a lot about them thanks to the numerous reports which have surfaced. The upcoming iPhone 6 and the iWatch have now seen their fair share of leaks. To summarize what we know so far, the iPhone 6 will be coming in two different variants with 4.7 and 5.5 inch screen variations. An A8 processor capable of 2 GHz frequency will be on board. The 4.7 inch version will be coming with 1 GB RAM while the 5.5 inch iPhone 6 will come with 2 GB RAM on board. The iWatch on the other hand will be centered towards health and fitness, coming with health kit and new sensors. NFC will be present on the iWatch as well, in addition to the iPhone 6. If true, then making mobile payments will be much easier then before. So stay tuned for updates and click here to watch Apple’s event live.